Among the most familiar hip-hop producers in today’s hip-hop game is Providence-native araabMUZIK. He first gained serious attention in 2007 when he became associated with the Dipset, and subsequently began producing beats for Diplomat artists. He has released seven of his own projects – some solely instrumental, others not – and has produced for many noteworthy artists. His list of collaborators includes Hell Rell, Cam’ron, J.R. Writer, DJ Kayslay, Capone-N-Noreaga, Jim Jones, Lloyd Banks, Styles P, 50 Cent, Slaughterhouse, ASAP Mob, Swizz Beatz, Joe Budden, Fabolous, Troy Ave, and various other hip-hop figures. 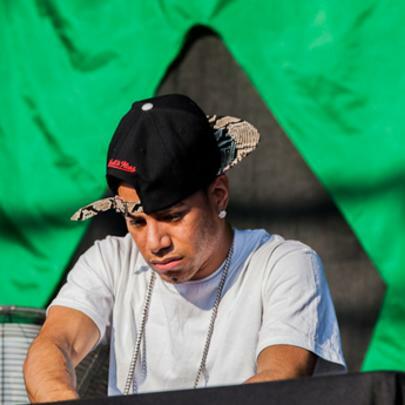 In 2013, araabMUZIK was shot in an attempted robbery in his home state of Rhode Island. He was subsequently forced to cancel tour dates while he recovered. He released his “The Remixes, Vol. 1” album in 2013, and has been working on a collaborative project with A$AP Rocky called “A$VPMUZIK”. Stay posted for the track listing and release date. He is of Dominican and Guatemalan ancestry. He learned to play drums at age three; piano at age ten, and at twelve began producing his own music. He was influenced by iconic producers such as Dr. Dre, Just Blaze, and 9th Wonder. He got his stage name because his friend called him “Arab”, and he just worked off of it. He was named Best Producer in New York by the Voice in 2011.